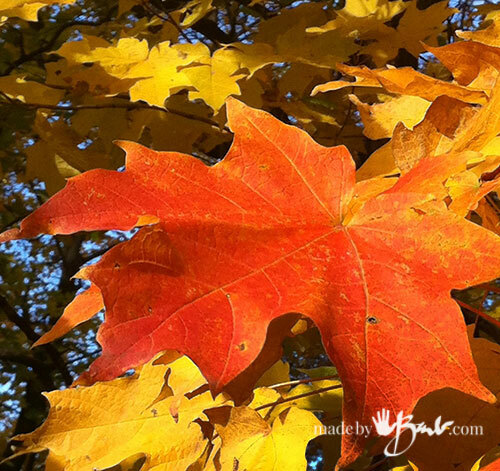 When was the last time you REALLY looked closely at the details of a leaf ?! Also fall brings out such amazing colours and awakens my urge to grab oil paints and smear some red and yellow across a canvas! ‘But those vein details are so amazing. Sadly the caterpillars have been at an all time high here so finding some with no holes has been a chore… Trust me, it’s a super simple casting project. 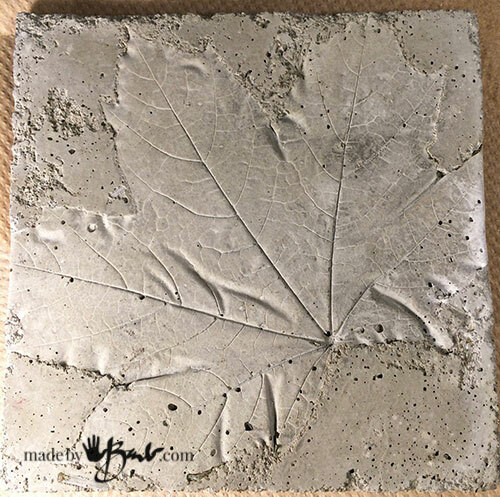 To make your mold, plan a 7.5 ” square in the middle of the vinyl tile. 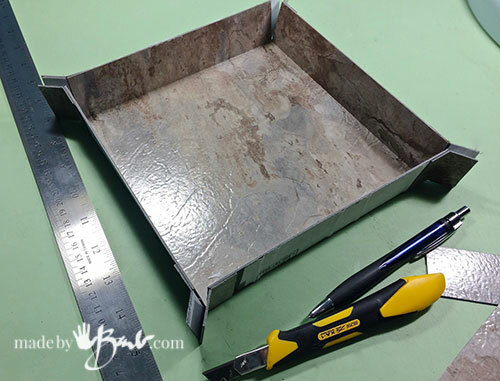 You are essentially making a box; the sides will be about 2.25″(as that is what is left of a 12″ tile) Score from the paper side and bend to snap. DO NOT break away the walls. The tile will stay ‘hinged’ at the score line and create a great clean crisp seam. Cut out the corners to make your box. If you like to make many and easy opening you can fashion yourself some corner tabs with the leftover and this will allow easy clipping with the clamps. How easy was that?! You could use a found container but many just look too much like a ‘tupperware’. This is much more contemporary as a simple shape. 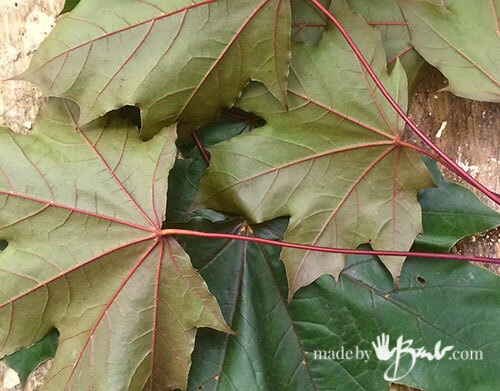 Place your leaf with the underside veins facing up. It should be quite flat. Flatten the first layer of the Rapid Set evenly. 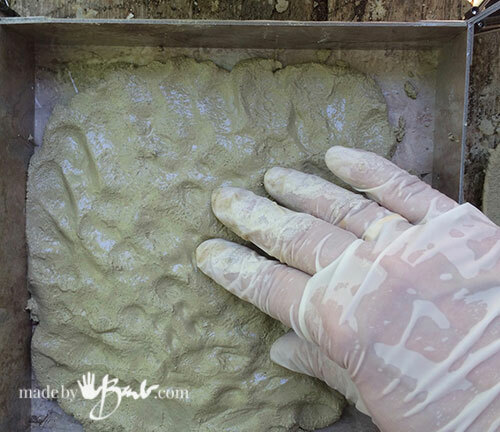 Once it is fairly flat mix another amount that is more of a pourable consistency (add fibres if you like for extra strength) Mine ended up with about 1/2″ (12mm) thickness. I have however had some thinner and still hold well. I am always amazed at how fast it sets and how strong. 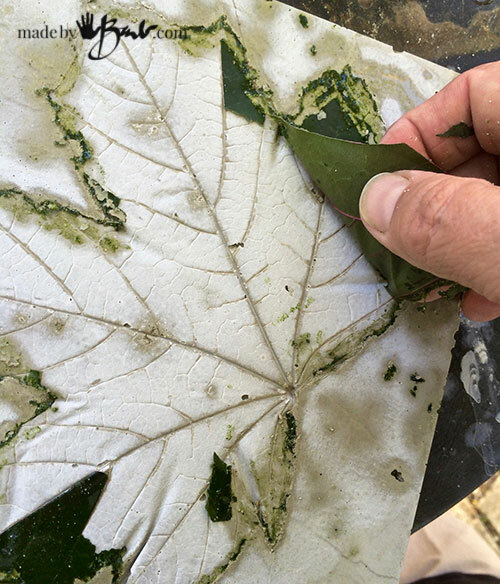 Once it has set (about an hour) you can unmold the cast leaf. 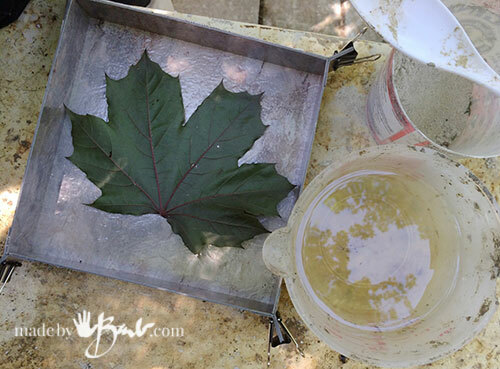 Don’t worry about the area that had concrete creep under the leaf… Sand any edges if needed or desired. It can be a bit tedious to remove the leaf. If it is still fresh it will pull away easily. The areas where it creeped will need to be gently chipped away. Use something like the rounded end of an old toothbrush to make that thin layer fall off while supported on a flat surface to reduce stress on the trivet. 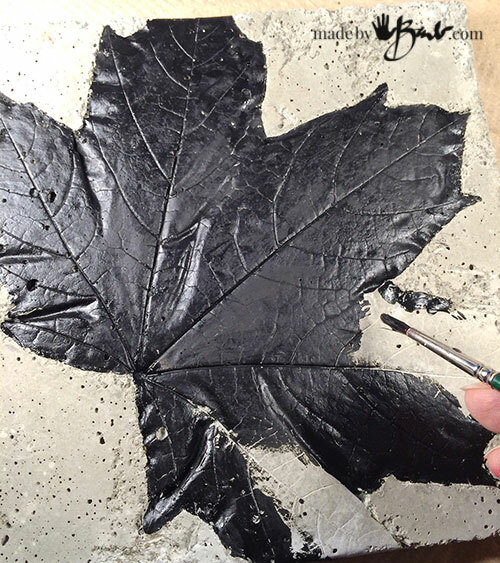 The plastic will tend to scratch the concrete less and give you a defined edge of the leaf. Once quite clean you can give it a good scrub with that toothbrush. 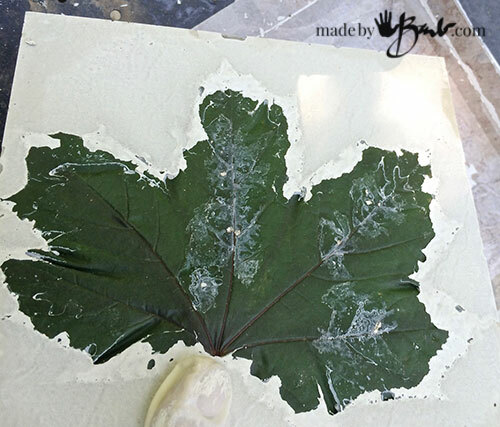 To start paint the whole leaf a dark colour. This will be the main colour of the dark areas. To accent the details and make them ‘pop’ dry-brushing is the best! This paint technique is invaluable for working with textures! I use it ALL the time. 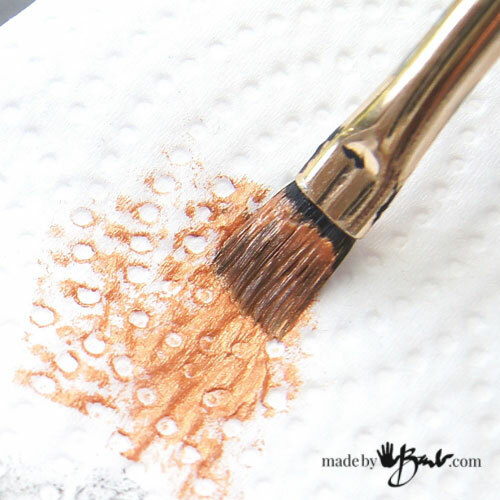 Make sure you don’t have too much paint on your brush by rubbing off most of it on a towel. That is the magic key to this subtle technique. Scrub across the surface repeatedly (I like to use older brushes) until you start to see the details come out… like magic. That’s it! 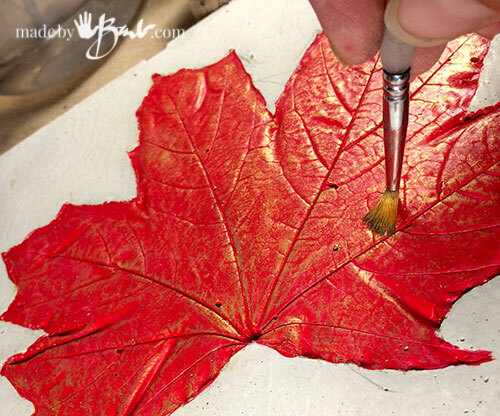 Super easy and the highlights are perfect to look like an actual metal leaf. 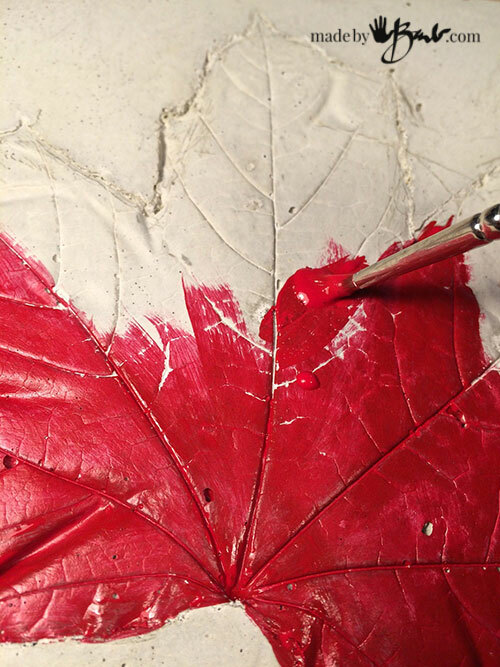 If you like to be even more creative you can add more detail by a thin ‘antiquing‘ wash to darken the veins. Note the great stone-like texture! 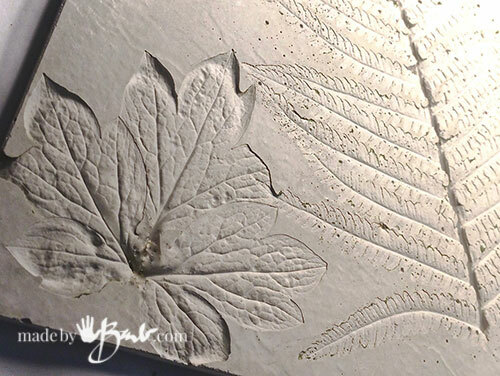 It is as if you have made your own fossil (hmmm an idea for another project?!) 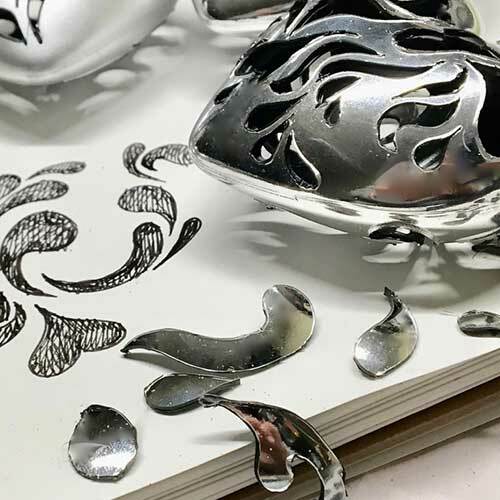 It is so lovely textural it could just be left unpainted as well. My favourite way is to start with a layer of black paint. Then have fun with the metallics. Maybe use a few different ones to dry-brush. Once you get going there is no stopping, and no drawing skills needed. Isn’t mother nature amazing to create such art?! I must say; so amazing for such little effort. Looks quite complicated but one of my easiest concrete projects. Why not make some with other plants; endless possibilties. 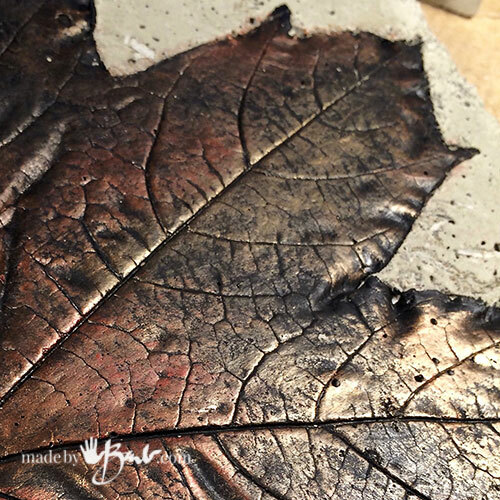 The texture of the vinyl tile works well for this project as a background. To finish the back you can add some round self adhesive felt feet. 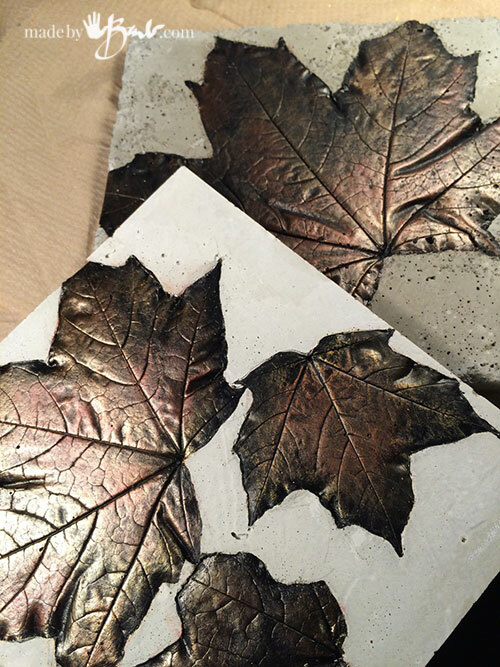 Enjoy your Metallic Concrete Leaf trivet indoors or out (seal if desired) and celebrate Canada’s birthday with us! What fun!! All your projects are really great. Thank you for sharing. 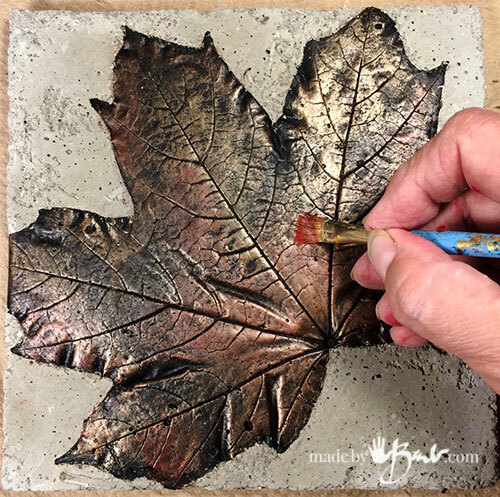 loving the ‘easy’ part and the painting technique on this one … perfect rustic summer coaster / platter for wrought iron table tops that need the flat surface for glasses! 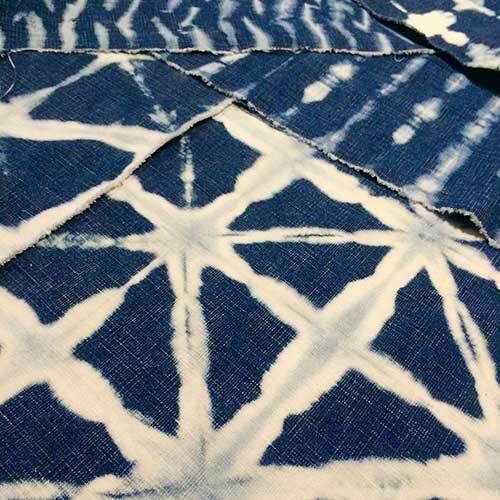 How I absolutely love seeing your wonderful projects! 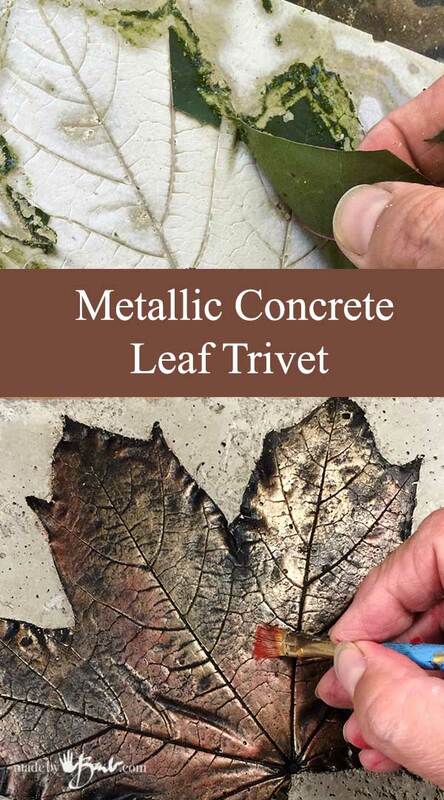 Your leaf is so beautiful; I can’t wait to get started on this. Thank you Barb! They are amazingly detailed for being so easy. I was eyeing the ferns as well! Just make sure they are quite flat. 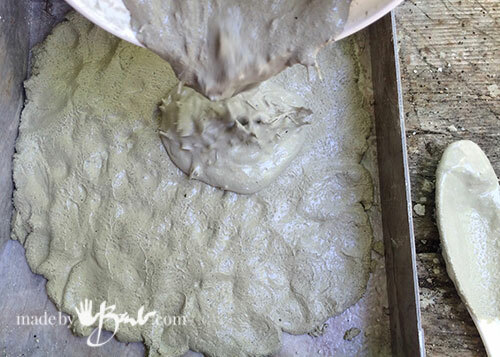 I’ve been pressing a few in books to have them ready… Happy Concreting! Hi Barb, You are such a creative artist. Thank you for sharing your talent. 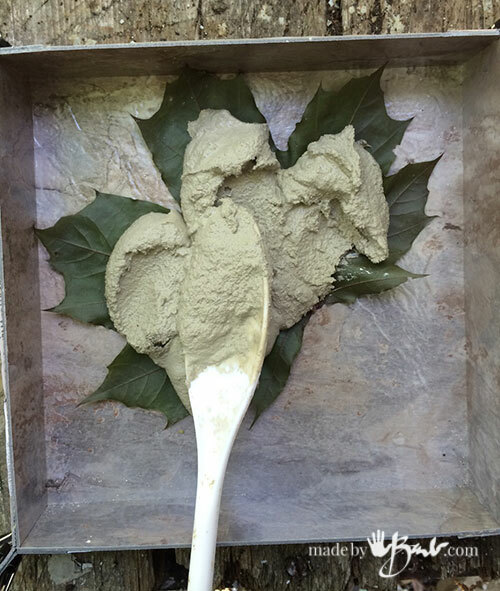 My question to you is…What “medium” do I use for the pigment powders I want to use on my elephant ear leaves made of concrete? 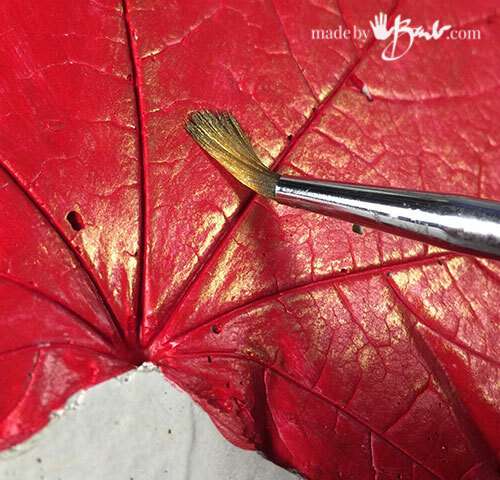 The pigments weren’t cheap & it’s almost impossible to find out what others have used on their leaves when it comes to painting with pigments. Loving your projects, although haven’t made any as yet. 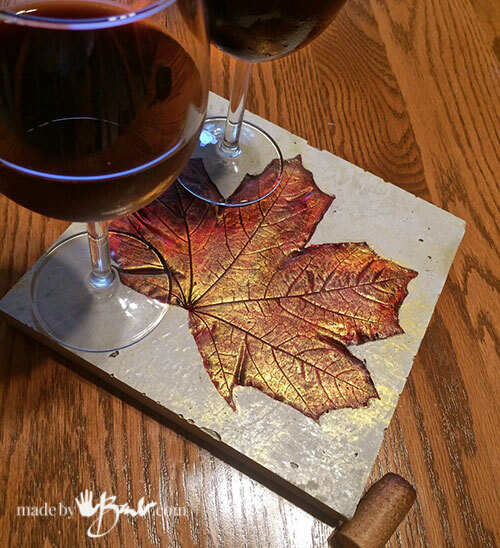 What would you use to seal the trivet if wanting to use/leave it outdoors, please? Any surface that is left horizontal may stay wet longer. I have rocks that were painted many years ago with acrylic outdoor paint and they have held really well. There are acrylic paints that state exterior use. Just don’t let them sit in a wet place. or search for exterior acrylic varnish. 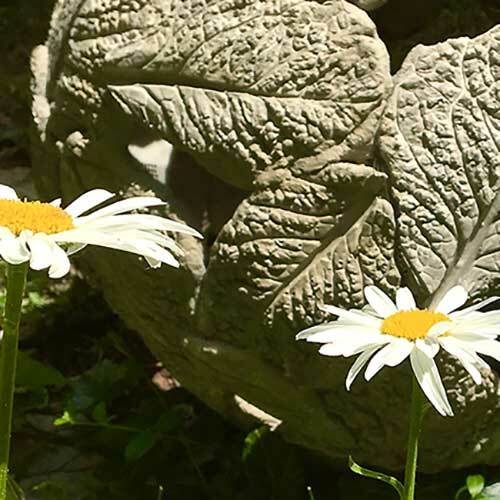 Concrete likes to breath so I like to keep mine natural above all or keep colour to a minimum outside.